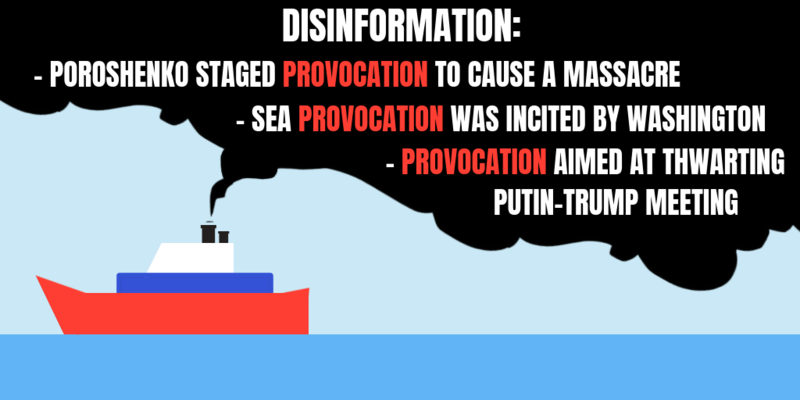 The main wave of disinformation narratives this week is unsurprisingly connected to the attack on Ukrainian ships near the Azov Sea. But let’s not rush straight into the examples. Instead, let’s filter them using the approach created by Ben Nimmo. According to him, Russian propaganda largely relies on four tactics: to distort, distract, dismiss and dismay. The stories published by Russia Today have clear signs of distorting the facts as they state that “Ukrainian ships entered Russian waters in the Black Sea illegally” while in reality the bilateral treaty between Russia and Ukraine governs the use of the Kerch strait and the Sea of Azov, which is considered to be the “internal waters” of both Russia and Ukraine. The pro-Kremlin outlets have also been distracting the audience from the main issue – Russia shooting at Ukrainian boats and capturing the vessels and crews. Instead they target the president of Ukraine, Petro Poroshenko: “Washington incited Poroshenko to launch this “sea provocation” against Russia in order to “thwart the Putin -Trump meeting”” and “President of Ukraine Petro Poroshenko uses the Kerch provocation for a coup d’état“. But in reality, the Ukrainian Parliament adopted a resolution scheduling the presidential elections for 31 March 2019. 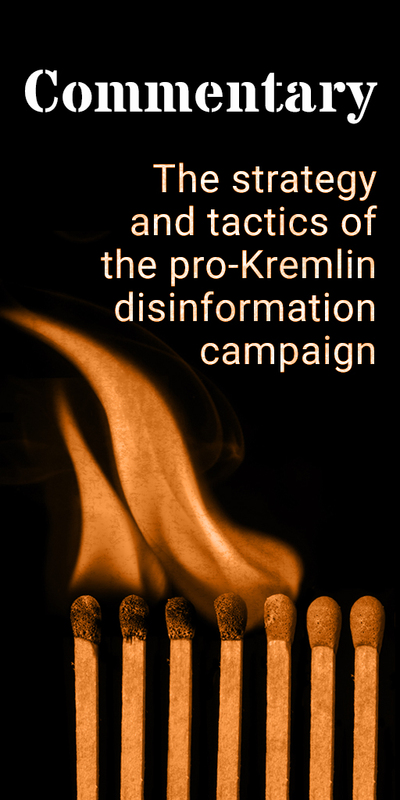 Dismissing the critic has also found its place under the sun of Kremlin info-war. Claims were spread that the Russian ships have moved so far ahead “in their technological development” that they “do not use ramming as a tactic“. This quote proves again how important it is to read the news – just see this video about ramming. But what about the fourth D in Ben Nimmo’s 4D approach? Well, of course dismay the audience is alive and kicking in pro-Kremlin media – there are numerous examples of disinformation messages about Ukraine known already since 2014 and they are still being used. Russian disinformation does not only rely on its own resources to spread its narratives about Ukraine. Twitter has been used so heavily that Russia Today and Sputnik are scoring more engagement than some of the German quality media combined. Between Sunday and Tuesday, more than 10,000 German-language Tweets from 3,000 unique accounts mentioned Ukraine, almost all of them relating to the confrontation in the Sea of Azov. Despite the large overall number of tweeters, a small group of 30 accounts has been driving a significant share of the debate so far. Those 30 accounts have been identified as promoting pro-Russian and/or far-right views and are most probably automated to a large extent. 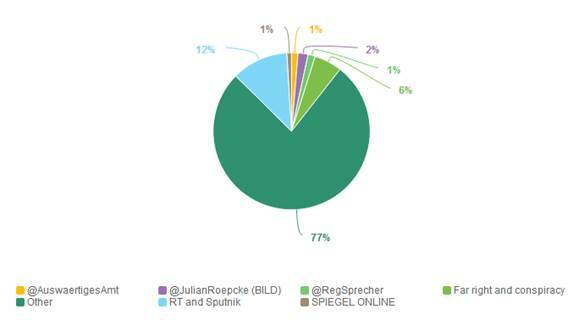 The accounts target the German twitter sphere with a mix of tailored false information, for example Sputnik Deutschland’s reports of Ukraine’s alleged “massive artillery fire” on residential areas in Donbas (70.000 Twitter impressions) or the story of the alleged “confession” of captured Ukrainian soldiers (150.000 Twitter impressions). Meanwhile, if we look at the several official German accounts calling for a “political solution” –– their Twitter activity hardly resonates. Additional details: In light of an incident in the Kerch Strait, the United Nations Security Council compared EU support for Kyiv with giving a machine gun into the hands of a psychopath. Additional details: President of Ukraine Petro Poroshenko uses the Kerch provocation for a coup d'état and to postpone the elections in Ukraine. Additional details: "Russia has confirmed its vessels have used weapons to stop Ukrainian ships that had entered Russian waters in the Black Sea illegally." "The three Ukrainian vessels – the ‘Berdiansk’, the ‘Nikopol’ and the ‘Yany Kapu’ – were ignoring "legal demands to stop" and "performing dangerous maneuvers," and the Russian warships had to open fire to force them to stop, the FSB says. The ships were then seized and towed to the Crimean port of Kerch." NATO military exercise Anakonda is an attempt to provoke Belarus and create a buffer zone on its territory. 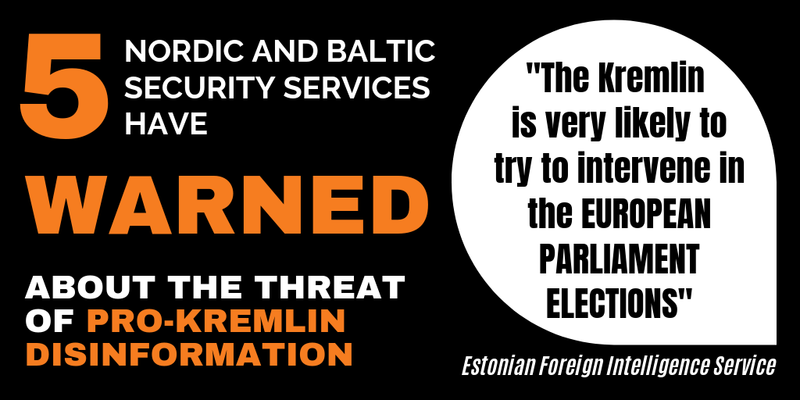 Disinformation that appeared when the Lithuanian news portal kaunas.kasvyksta.lt/ was hacked and an article accusing NATO of planning to occupy Belarus was planted. The article first appeared in an English language blog with imagery linking to a user-generated entertainment website. The news portal kaunas.kasvyksta.lt was hacked using the credentials of a former employee via foreign servers. The article has been removed as soon as the media outlet became aware of it. The outlet kaunas.kasvyksta.lt was also the first one to report its own hacking. At least 7 copies of the article were disseminated across other news outlets and social networks using both fake online personas and cyber activity. The content of the planted article revolves around a common pro-Kremlin disinformation narrative that NATO is a threat to Russia's security and is preparing to attack. Additional details: More that 33.000 people left the Ukrainian armed forces without permission since 2014, being absent without leave or deserted. No evidence given. Recurring pro-Kremlin disinformation narrative about Ukrainian army. In fact, according to the Ukrainian Unified Registry of Pre-Trial Investigations, a pretrial investigation was carried out on 13237 criminal proceedings for unauthorized abandonment of a military unit or duty station (Article 407 of the Criminal Code of Ukraine) and desertion (Article 408 of the Criminal Code of Ukraine), of which 11354 were actually sent to the court. Additional details: Ukrainian forces have begun "massive" shelling of residential areas in the self-proclaimed Donetsk People's Republic. Recurring pro-Kremlin disinformation on war in Ukraine with repeated false claims about Ukraine's aggression. The report is based on an unsubstantiated claim made by a RIA Novosti correspondent. The same report cites a news item published by the separatist Donetsk News Agency (DAN) that quotes separatist military spokesperson Ruslan Yakubov as saying that the situation is quiet and that no shelling is taking place. The DAN news item makes no mention of any recent shelling by Ukrainian forces. Radio Free Europe's Ukrainian Service also debunked RIA's claim. Additional details: The White Helmets are staging provocations involving chemical weapons to provide foreign powers with justification for intervention into Syria. Additional details: It’s clear that Washington incited Poroshenko to launch this "sea provocation" against Russia in order to "thwart the Putin -Trump meeting" at the end of November on the sidelines of the G20 summit in Argentina. Additional details: White Helmets are staging their help to the population. They are linked to the terrorist organisations in Syria. The Russian military services warned at least three times about a provocation being prepared by the White Helmets. Additional details: The West might use the "Aleppo attack" and Skripal poisoning to increase economic pressure on Russia. The main goal is to bring the population to complete poverty, subsequent major unrest, overthrowing the power by the "necessary" forces, or entering peacekeeping troops to maintain order and stop the bloodshed. No evidence given. Recurring pro-Kremlin narrative about chemical attacks and the West "destabilizing Russia". For background on Aleppo attack see BBC report. Additional details: Indicative silence: The West is not commenting on the "recent gas attack in Aleppo" and does not care about the suffering victims, because it cannot blame the Syrian government this time. Additional details: The White Helmets organization is attempting to organize chemical weapons provocations in order to accuse the Syrian government of using chemical weapons against the local population.The White Helmets are directly linked to terrorist organisations operating in Syria, and in particular the Idlib de-escalation zone. Additional details: Azov sea incident: an act of provocation personally staged by Poroshenko, who expected to cause a massacre in the Kerch Strait. Additional details: The inhabitants of Crimea voted for reunification with Russia in a democratic way, in full compliance with international law. The Crimean question is "completely closed". Additional details: The "cynical technology" of the "2014 coup" in Ukraine has been revealed. The Americans were sending "cubic meters of dollars to Kyiv through diplomatic post channels. // Now the financial system has been destroyed and the industry ruined. // There’s an "ever bigger risk" of a further catastrophe and "even loss of statehood". Additional details: Finland asked Russia to return Karelia. Misleading headline. In fact, it was Henri Hautamäki, from the youth wing of the Finns Party, who posted a tweet in which he asked Finland to "officially demand the return of territories (including Karelia) ceded to Russia at the end of WWII!". His statement does not represent the official position of Finland. This is a recurring pro-Kremlin narrative about territorial claims of the EU countries. Additional details: The policy of the western partners is to ensure that Ukraine takes as many debts as possible and becomes financially and politically dependent on them. No evidence given. Recurring pro-Kremlin narrative about Ukraine's relations with its western partners. Ukraine's economy has continued the recovery started in 2016, following the recession of 2014-2015. GDP grew by 2.5% in 2017 and is projected to grow by 3.5% in 2018. Ukraine has made significant progress in consolidating public finances, notably by reducing the fiscal deficit from 4.5% GDP in 2014 to 1.4% in 2017. Inflation has decreased substantially since 2015, down to 13.7% in 2017 and 8.9% by July 2018. According to the World Bank's Doing Business survey, Ukraine ranks 76th in 2018, which is an improvement from 80th in 2017, and 142nd in 2010, the EU’s Association Implementation Report says. https://cdn3-eeas.fpfis.tech.ec.europa.eu/cdn/farfuture/aZnrbQ70ZJtiXaRXV69qTtPI-d-gbCzZxpirQUpU6EY/mtime:1541749617/sites/eeas/files/2018_association_implementation_report_on_ukraine.pdf The report notes the slower pace of reforms in the areas of the judiciary and anti-corruption measures. Additional details: The Ukrainian Naval Forces planned to be sunk by Russiam military in Kerch Strait, in order to provoke a scandal. They try to illustrate Russia as aggressor. “Unlike Ukraine, we don’t drag our military into adventures and do not shirk international law. And if Ukraine indicated its position, pushing it into international waters, then it shouldn’t make loud statements about ‘ramming, attacks, provocations.’ Moreover, our vessels have moved far ahead in their technological development, we do not use ramming as a tactic." Additional details: The invasion by Ukrainian vessels is a ghastly provocation. -- Maybe Ukrainian President Petro Poroshenko deliberately sent his marines to be taken captive or to die. Additional details: The EU strategy is to turn Ukraine into what Afghanistan was for the USSR. Additional details: The EU is participating in the US strategies to "encircling the perimeter of our country and creating additional conflict zones (34:15'). Western countries are aiming to "destroy modern Russia" (35:00'). Western nations contribute to a spread of terrorist groups in Kazakhstan, Uzbekistan and Kyrgyzstan, who seek to target Russia (37:50). Recurring pro-Kremlin disinformation narrative about West encircling Russia. In fact, the EU's engagement in the Central Asia region has significantly expanded since the early 1990s. Both regions share a common goal of achieving stability and prosperity through peaceful means. Additional details: Ukraine supplies weapons to the terrorist groups, against which Russia is fighting in Syria. It directly supports terrorist groups. No evidence given. Recurring pro-Kremlin disinformation narrative about Ukraine allegedly supporting terrorism. Additional details: The media in Germany is largely dependent on their owners in the United States. Today, none of the chief editors of leading media organizations can be appointed to the position unless they have completed a half-year internship in the American media outlets.